It’s not cheating if you don’t get caught. Spoiler alert: You’re going to get caught. Good lord, hockey players, have I taught you nothing about never agreeing to lip-synch anything on camera? The Shaybu Shaybu guys think you’re embarrassing yourselves. And yes, some people like this. Those people are wrong. Everyone else is right. End of discussion. Which would be fine, except that they’re teammates. Now, I think we can all agree that this is not funny, because van Riemsdyk was shaken up on the play. And collisions that result in an injury, even a minor one, are never funny. Anyone who disagrees is a terrible monster. In fact, the mere suggestion otherwise is enough to make me close down my browser in rage, and I would suggest that all you like-minded people do the same! So … did it work? Are all the “never laugh at any injury ever” folks gone? Cool. Just wanted to clear them out before we get to today’s YouTube clip farther down the post. Back to our regularly scheduled programming. The issue: Rich Peverley of the Dallas Stars suffered a cardiac event during Monday’s game, in a frightening scene that initially had many fans fearing the worse. And, like any serious health or medical situation in the NHL, the incident immediately inspired hockey fans to start creating Internet meme-based jokes to tout their sport’s superiority. The outrage: Hockey fans are the absolute worst, said hockey fans. Is it justified? First, let’s sort through the rage. From the moment the memes started appearing, the backlash was immediate and severe. It ranged from the level-headed to the disappointed to the angry to the disgusted. In a sport where fans and media can’t ever seem to agree on anything, this reaction was nearly unanimous: The pro-hockey, anti–other sports memes are unfunny and unfair (and maybe even at least a little racist), and they reinforce the stereotype that all hockey fans are ridiculously hypersensitive to how others perceive them. I say “nearly unanimous” because a few brave souls, most notably Puck Daddy’s Greg Wyshynski, pushed back against the onslaught, defending the spirit (if not the actual execution) of the jokes. You can imagine how that went. We thank Greg for his contributions to the hockey world and will mourn him greatly. Here’s the thing: With one important caveat that we’ll get to in a second, I’m kind of with Wysh on this one. Yes, hockey fans can be way too sensitive when it comes to other sports. We’ve covered that in this space before, specifically the obnoxious way some hockey fans can’t let another sport have a nice moment without dumping all over it. That’s not cool. But there’s a difference between taking cheap shots at someone else’s favorite sport just for the sake of it, and celebrating the things you love about your own. Hockey players are tough. They are (generally) a pretty team-first bunch. Those are good things, and hockey fans should want to celebrate them. And if they want to do that by making comparisons to other sports, fine. But — and here’s that one caveat — you still have to make sense, which is a test that many of the most popular hockey memes of recent years fail miserably. That Jonathan Toews/LeBron James “I vs. We” thing that still pops up everywhere wasn’t even true, and anything that tries to portray other world-class athletes as cowardly wimps is dumb. If you don’t know anything about LeBron or Kobe Bryant beyond “he’s a basketball player I’ve heard of,” then maybe sit this one out. But if you think hockey’s better than other sports in some small way, and you can say so while being both funny and fair, then go ahead and do it. You’re allowed to think hockey is better than other sports. Oddly enough, that’s kind of a big part of being a hockey fan. Just be ready to get pummelled for it. Somehow, ridiculously hypersensitive hockey fans have become the latest topic for hockey fans to be ridiculously hypersensitive about. Last week I took my kids to see The Lego Movie. Not bad at all, as far as kids’ movies go. Two thumbs up. But it reminded me of my very favorite hockey player from when I was a little kid. I wasn’t even really a fan yet, but my dad would have the game on at night as I was getting ready for bed, and I’d overhear the announcers describing the action. And there was one player who stood out, because to my kid ears he had the greatest name in the world: Builder Lego. Builder Lego played center for the Toronto Maple Leafs in the early ’80s, often on the first line with star winger Rick Vaive. 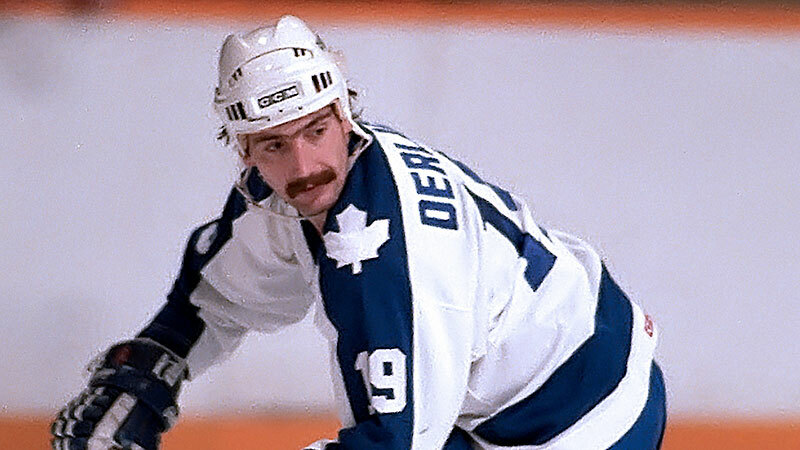 He had back-to-back 30-goal seasons, and cracked the 40-goal mark in 1983-84. He was a former junior star, and at various points in his career he’d also play for the Jets, Canucks, Bruins, and Nordiques. Builder Lego had a cool mustache. When I got a little older, I realized that his name wasn’t really Builder Lego after all. It was Bill Derlago. I probably don’t have to tell you that this was a crushing disappointment, and it probably made me cry. So in a sense, it was my first exposure to what life would be like as a Maple Leafs fan. When it comes to my hockey fan identity, Builder Lego truly was the building block. In which I will complain about things that matter probably only to me. The NHL held its annual GM meetings this week, and one of the key items on the agenda was reducing the number of shootouts. There are several innovative solutions available that would address the problem, from doubling the length of overtime to playing 3-on-3 in sudden death to moving to a 3-2-1-0 point system to just bringing back ties like the hockey gods intended. So, of course, the NHL didn’t go with any of them. Instead, the league seems to have settled on a minor change: having the teams switch ends before overtime, to create a “long change” situation. This shouldn’t have been a surprise. After all, if there’s anything the NHL does well, it’s making small fixes to big problems. That’s how we wound up addressing massive drops in scoring rates with a trapezoid. It’s how we dealt with the potential dangers of fighting by telling guys to just leave their helmets on. And it’s how we’re going to wind up addressing “way too many shootouts” by switching ends, which doesn’t seem like the sort of change that will have much impact at all. Or will it? There seems to be some pretty convincing statistical evidence that the long change really does produce more offense, because goal scoring goes up in the second period. (Today, teams have the long change in the second, and the short change in the first, third, and overtime.) So maybe the NHL GMs are on to something after all. But if so, that leads to this week’s annoyance: Why don’t we already have the long change during the first and third? Or better yet, why not just have the long change for the entire game? Is there really a good reason to switch ends every period, other than “this is how we’ve always done it”? The NHL needs more offense, yet seems fiercely resistant to making common-sense changes like introducing bigger nets. Maybe at least part of the answer was right in front of us all along. Long changes for everyone, all the time! It makes sense. So, needless to say, they won’t do it. But if we’re lucky, maybe they’ll pretend to consider it at the next 20 years’ worth of GM meetings. This week, Don Cherry found out that he would continue to exist. Well, that may be a little dramatic, since he was probably going to exist anyway. But this week, we learned that Cherry as we know and love him – on Coach’s Corner, next to Ron MacLean, ranting and raving about various topics of the day during intermission on Saturday night – would still be a part of Hockey Night in Canada. That had been in doubt after the NHL signed a new Canadian television deal with media giant Rogers Communications. Rogers already owns a cable sports channel, Sportsnet, and has plenty of talent of its own available. There was talk that it could decide to jettison Cherry, or at least change his role. Cherry himself had even told reporters he had no idea if he still had a job. Thankfully, he still does, as we learned from this week’s unveiling of the new Hockey Night in Canada “dream team” (as they’re being referred to by Rogers’s PR people and absolutely nobody else, because real people don’t talk like that). While the changes will mean increased roles for talented broadcasters like George Stroumboulopoulos and Jeff Marek, Cherry will apparently keep essentially the same job description. MacLean will see his hosting role reduced, but will still handle Coach’s Corner. All is as it should be. A crisis has been averted. Also, Don Cherry yelled at Roberto Luongo for making jokes on Twitter. In addition to being a great source of adorable pets and functionally illiterate commenters, YouTube is a goldmine for old hockey clips. In this section we find one, and break it down in way too much detail. The Dallas Stars retired Mike Modano’s number this week, a well-deserved honor for the greatest player in franchise history. So to mark the occasion, this week’s YouTube breakdown will feature the most memorable moment of his career. Here’s what I love about Modano — he played 20 years, won a Cup, and scored almost 1,400 points. And yet when I say “the most memorable moment of his career,” every old-school hockey fans knows exactly what’s coming next. So let’s set the scene. It’s February 26, 1994, and the Stars are in the midst of their first season in Dallas. Modano is having the best season of his career, on his way to recording a 50-goal season, as the Stars host the New York Rangers. We start with Ulf Dahlen carrying the puck across the Rangers zone. He feeds a pass to Modano, who looks down to collect it and OH GOOD GOD MARK MESSIER JUST MURDERED HIM. So Modano is KO’d by the headshot and slides into the boards, where he lies on the ice without moving until an official skates over and accidentally kicks him, which I always thought was a nice touch. Yeah, I’m going to go with “all the games.” Literally every one of them. Even the ones involving other teams. Anyone who threw this hit today would immediately be loaded into a rocket and fired into the sun. And here’s what Messier actually got: nothing. No suspension. Not even a minor penalty. Back in 1994, this was considered a squeaky-clean hit. Stars coach and GM Bob Gainey even blamed it on Modano, saying: “I didn’t think it was a dirty hit. He got his shoulder right on the jaw. I don’t know if it was so much a hit as Mike turned and skated right into him.” I swear to you that’s a real quote. Seriously, think back to this hit the next time somebody tries to tell you that today’s NHL is more dangerous than ever. Right now, the league’s entire ban on blindside head shots could just be this clip running on a loop in the middle of a red circle with a line through it. Speaking of red circles, on the second replay we get a nice view of Modano’s head leaving a spiral pattern of blood on the ice as he spins around. Again: 20 years ago, this was a perfectly clean hit and was mostly Modano’s fault. But sure, the NHL hasn’t done anything to try to make the game safer. OK, I’m done with the moral high ground routine. So, uh … who’s ready to laugh at somebody else’s misfortune? The clip cuts away as the trainers continue to tend to Modano on the ice. When it comes back, they’ve got him loaded onto a stretcher and are taking him to an ambulance. And while we know now that he turned out to be OK, at this point we had no idea. He looks bad. It’s all very somber. The medics are clearly taking this very seriously. I mean, that’s awful, and it shouldn’t be funny, but … 20 years later, it’s OK to laugh, right? Yeah, I’m 60 percent sure it’s OK to laugh. Actually, everyone blames the EMTs for dropping the stretcher, but if I remember right the story at the time was that one of the Stars medical staff had accidentally touched the stretcher’s release mechanism, causing it to collapse. Presumably it was the same sort of switch somebody pressed during the third period of this week’s Canucks-Islanders game. The play-by-play guy’s reaction is classic: “Oh look at that! Oh my goodness. I … I can’t believe we just saw that.” How is it that hockey fans haven’t taken to adding this sound bite to other famous NHL moments, like we do with Jim Ross? Why can’t I download a copy of the Rask-for-Raycroft trade announcement with this sound bite dubbed in? I don’t understand you sometimes, Internet. By the way, if carrying an NHL star on a collapsible stretcher seems old-school, remember that it wasn’t that long ago that injured players got carried off by their own teammates on what was basically two sticks with a sheet between them. So … progress? These days, blindside hits are illegal, head injuries are taken much more seriously, and NHL medical care has come a long way (as we saw just this week in Dallas during that awful Peverley incident). In 1994, if you got hit like this, it was your fault and they carried you out on a defective stretcher that apparently had an “EJECT” button on the side. You know, maybe the Gary Bettman era hasn’t been all bad.